SPECIAL LAUNCH PRICE - Thank you for all your support, we have a special launch price for the first 30 buyers. We have cut the price by $90 (normally $170 Gig). So put in your order now before we bump up the price! I know what's going in your mind, What's Google STACKS And Do I Really Need this? Don't worry we have answered everything in this Infographic for you. Geo-Tagged all the Images before using them with NAP details. Nonmachine readable DAS profiles involved in package 2 for maximum trust, relevancy and authority boost. I HATE IT when gigs say "done for you", and then expect you to provide all the information! WE WILL EVEN WRITE THE ARTICLE FOR YOU... FOR FREE! You get 70% reports which include Logins Details for all your Branded Profiles, Google Sites, and Social Signal Screenshots. We can not risk outing our Hi TF sites and Client Information to everyone. If it is possible to penalize any website using Google Stacks or GSA Campaign, then I would penalize my competitor's websites first. Thus by penalizing all my competitor's websites, I would get the top position in search engine easily. So, there is no chance of getting penalized by google for using my Stacking or GSA Search Engine Ranker Campaign. We spin a giant master document of spun content related to your niche based on your keywords. (We do a paragraph level, phrase level, then word level spin of each text) Spinning is Spinning and you cannot get the super notch quality as like hand written content. From our testing, we have seen that Spin content works as good in Google Stacks too. 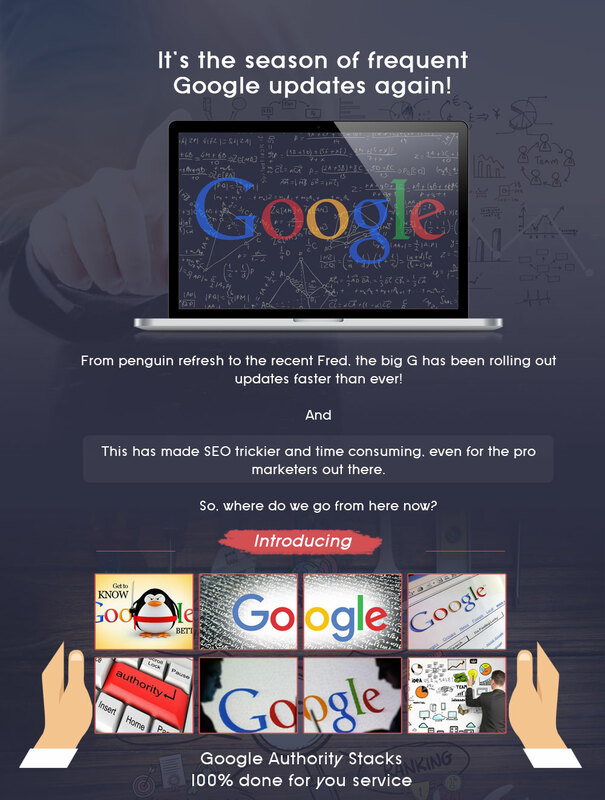 We give 100% Google indexing Guarantee of our sites.google.com property which carries the main juice. Well, let's make it simple, for low competition keywords don't burn your dollars and our Standard Package of $150 is fine, for Medium Competition goes with Package 2 and for high Competition, we recommend using 20 Profiles Along with Package 2 gig. Ok, I am ready to Order, what information do I need to supply you guys to kick start? 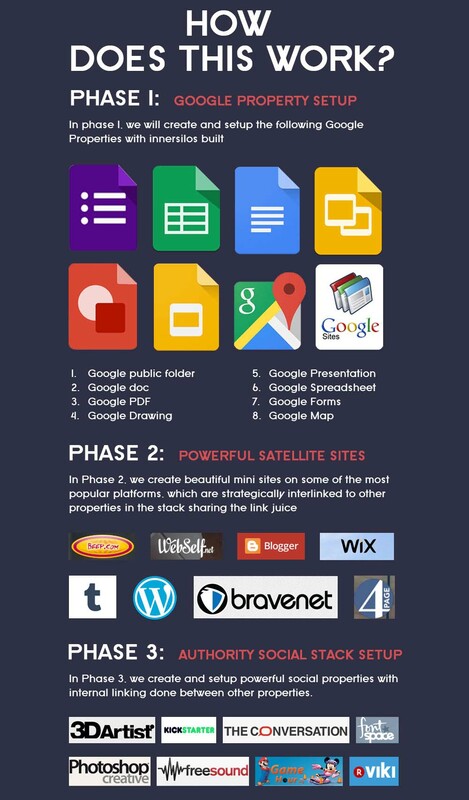 Q: Can you provide a sample of the Google Sites I will get as an end product. Q: Damm, you guys seem costly? If you have this question in mind then what do you rate yourself working 10-12 hrs on a single campaign? We may be costly (depending on your budget) because we know what value we can bring in to your client for long lasting rankings in SERP's. Thanks. 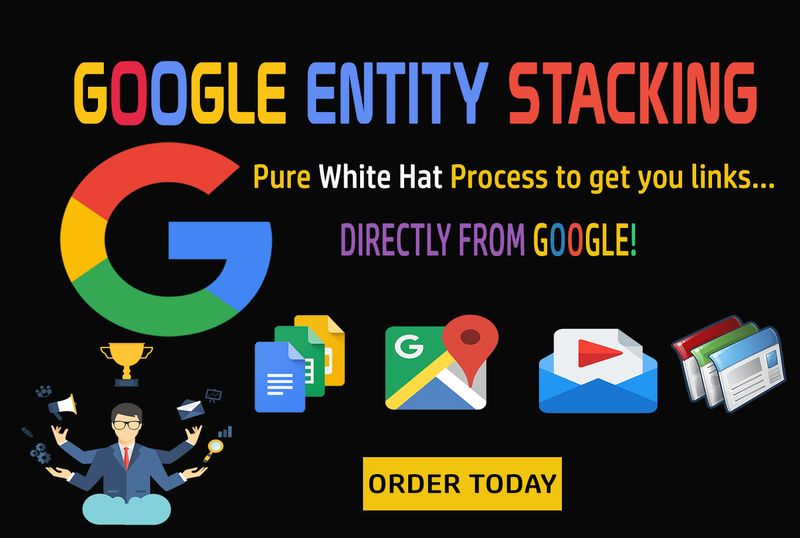 Google Entity Stack-GET POWERFUL LINKS FROM GOOGLE OWNED PROPERTIES is ranked 5 out of 5. Based on 24 user reviews.